Join Nicole Doherty for a yoga empowerment retreat in the majestic mountains of Ojai, CA at Villa Ojai. This rejuvenating weekend is designed to give you effective, practical tools that will empower you to explore new visions for your life! Enjoy daily sound healings, mantra, yoga, pranayama, meditation, chanting, organic vegetarian/vegan meals, hot tub, rock pools and nature hikes. Plus, enjoy a sampling of Nicole’s “Empower to Evolve” Workshop Series that she created for personal transformation. Through a combination of many holistic disciplines and practices, she will build a sacred space, creating an offering to your inner being to break through its limitations that hold you back from experiencing the fullness of who you really are. Empower yourself to evolve and create the life you desire! Can you give me the pricing on the retreat I see it starts at $500. Thanks for booking Sheryl! Excited to meet you and your family! My husband and I are interested in signing up for your Ojai retreat for a double room. Where do we sign up? I don’t see a credit card link. Also, if your arm balances workshop over? If so, any plans for another one? Sent you an email. Rooms are filling up very fast, only a few left! 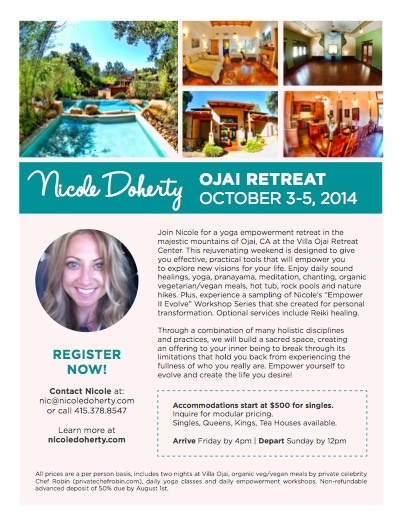 I want to sign-up for your Ojai retreat — looks fun and healthy! Hello Stephen! I hope you got my email with pricing! Namaste! Looking forward to it!! Hi Nicole! I’m really interesting in attending this retreat. Is there still space available? would be going solo, are there others going solo as well? Look forward to hearing from you! Thank you!!! I’m interested in your Ojai Yoga Retreat in October. Please send details on price and lodging and availability. Thank you. Shoot! I just realized this is this weekend. Are there any spots left, and how much is it?